The virtual server state manager enables the virtual server to be paused and saved in any state. This can be performed in the middle of any action, such as copying files or installing the operating system. Virtual server state managers are supported by all hypervisors. Work can therefore be resumed by the virtual server at a later time without any problems. Pause – The virtual server’s current status is saved and stored in the virtual server state file. 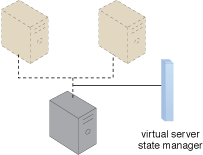 Play – The hypervisor reads and retrieves the virtual server’s state file, according to its previous state. During the deployment of an application, a situation may arise in which the system needs to be left running unattended for a certain period of time. However, the deployment process needs to be monitored once it is nearing completion. Using the state manager allows the process to be easily paused on the virtual server, and then resumed once the system can be properly monitored again. Figure 1 illustrates two virtual servers being monitored and controlled by a VIM with state management functions. Figure 1 – An example of a virtual server state manager monitoring two virtual servers.